Submitted by rthomas on Wed, 03/14/2012 - 13:15. 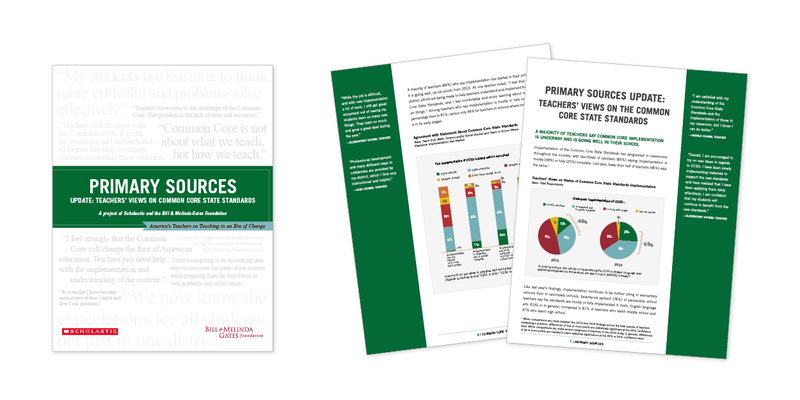 The Primary Sources series of reports is an ongoing dialogue with America's public school teachers on current issues in education. The first edition, which was fielded in 2009 and surveyed more than 40,000 teachers, is widely considered the largest-ever survey of America’s teachers. The following second and third editions were fielded in 2011 and 2013, respectively. The third survey asked 20,000 teachers their views on the many changes occurring in America’s classroom. Acknowledging the fast pace of these changes, the 2014 Update shows the impact of one year on teachers’ views on the Common Core State Standards. The goal of Primary Sources is to ensure the voice of teachers is at the center of the dialogue surrounding education. This report is for educators, policymakers, education stakeholders and parents. The Primary Sources update, fielded online by YouGov, includes teachers who participated in Primary Sources, Third Edition: America’s Teachers on Teaching in an Era of Change, which was fielded in July 2013. Teachers were once again contacted through Market Data Retrieval (MDR) and the study was conducted from July 1, 2014 through July 22, 2014; 1,676 pre-K–12 full-time public school classroom teachers completed the survey. All Common Core State Standards implementation states, plus the District of Columbia, are included in this research with the exception of Delaware. The states not included are Alaska, Indiana, Nebraska, South Carolina, Texas and Virginia. The sample is balanced on population characteristics including grade(s) taught, years of teaching experience, gender and urbanity, as was the case in each edition of Primary Sources. The survey invitation did not mention any content areas and the sample was monitored to ensure teachers who participated in this wave of the research were no more or less likely to have felt positively, negatively or neutrally toward the Common Core in 2013. The full methodology is available when you download the full report. In 2014, more teachers feel prepared to teach to the Common Core (79% in 2014 vs. 71% in 2013) and are more likely to say implementation is going well in their schools (68% in 2014 vs. 62% in 2013). 53% of teachers overall have seen a positive impact on their students’ ability to think critically and use reasoning skills due to Common Core implementation. 68% of teachers who report they are in schools where implementation was fully complete in the 2012–13 school year or earlier, say the same. 84% of teachers who have experienced more than one year of full implementation say they are enthusiastic about the implementation of the new standards. Fewer teachers overall this year than last say that they are enthusiastic about Common Core implementation (68% in 2014 vs. 73% in 2013); teachers are now also more likely to say implementation is challenging (81% in 2014 vs. 73% in 2013). Teachers continue to need support and resources, identifying Common Core–aligned instructional materials (86%), quality professional development (84%), additional planning time (78%) and opportunities to collaborate (78%) as critical to ensure successful implementation. Nearly every teacher (98%) agrees that teaching is more than a profession; it is how they make a difference in the world—one child at a time. 99% of teachers see their roles extending beyond academics to include things like reinforcing good citizenship, building resilience and developing social skills. Constantly changing demands on both students and teachers is the number one challenge most cited by teachers (82%). Overall, 88% of teachers agree the rewards of teaching outweigh the challenges. Nearly all (99%) teachers are evaluated at least once every few years, with 79% evaluated at least once a year. Similarly, 99% of teachers say they should receive a formal evaluation of their practice at least once every few years, with 77% saying they should receive a formal evaluation at least once a year. Most teachers (78%) say they find their evaluations somewhat, very or extremely helpful in refining or improving their practice; 69% receive feedback to refine or improve their practice. Teachers who do not find their evaluations very or extremely helpful share that they desire more actionable feedback (42%), increased fairness in the evaluations process (30%) and more—and better-qualified—evaluators and observers (23%). Teachers say time collaborating with colleagues is most often spent exchanging/sharing resources and lesson plans (76%) and learning from each other’s successes and challenges (68%). 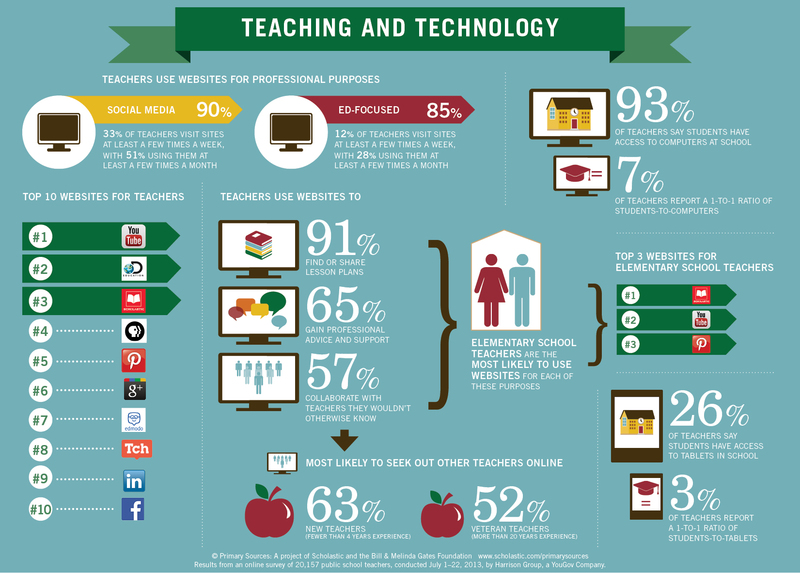 Teachers’ online collaboration often mirrors in-person collaboration, with 91% using websites to find or share lesson plans or other classroom content, 65% using websites for professional advice and support and 57% using websites to collaborate with teachers with whom they wouldn’t otherwise have had the opportunity. To create communities of support for their students, teachers actively build school-to-home connections with families and colleagues, both in school and online, with 95% of teachers encouraging parents of their students to reach out to them with questions and concerns. When asked about strategies for parents to engage in to help ensure their child succeeds in school, 98% of teachers say making sure a child misses as little school as possible is very or extremely helpful, followed closely by setting high expectations for their child (97%) and working in partnership with teachers when their child has challenges (97%). View highlighted data by state here. Note: State-by-state data for 2014 is not available due to smaller overall sample size.